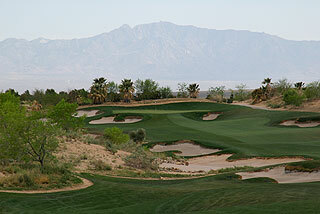 Primm Valley, located an easy 35 minutes south of Las Vegas off I-15 near the California/Nevada border, is a golf destination unto itself, with 2 Tom Fazio championship designs rated in the Top 100 Resort Courses You Can Play (Golf Magazine). Both courses also received the 4 1/2 star rating (out of 5) from Golf Digest. The Primm Valley Resort and Casino is minutes away, and is joined by Buffalo Bill's and Whiskey Pete's to form a trio of properties offering a variety of accommodations, attractions, resort amenities, dining opportunities and gaming options. The Two Guys Who Golf HIGHLY recommend a stay at any of the three casino resorts which all feature golf packages, as this is an incredibly convenient and comfortable way to enjoy the 2 spectacular courses available here. You can find plentiful information on the Primm Valley Resorts by visiting their page in our resort listing section under Las Vegas Golf, which includes sections for accommodations, golf facilities and resort amenities, plus a link to the Primm Valley website. 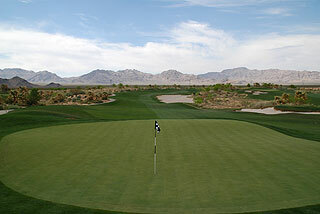 The facilities at the Primm Valley Golf Club include a full service clubhouse with pro shop, a beautiful restaurant, lounge and outdoor patio offering gorgeous golf course views, the Primm Valley Golf Academy, and an extensive practice area with a double-ended grass range. An expansive short game area with two bunkered greens and two putting greens are also complimentary for guests. All carts include an ice chest. On course you will find that the sprinkler heads provide measurements to the center of the green, and hole location information is provided to guests in yardage booklets and also on pin placement sheets. Each of the four sets of tee boxes on the Desert and Lakes Courses also provide yardages measured to the center of the green. Impressive! Anyone who has ventured to the sprawling Vegas Valley (we include the area from St. George, thru Vegas to Primm) for golf knows there are some wonderful golf properties in this area. So good are the choices in fact, that it is tough to number them 1 through 10. 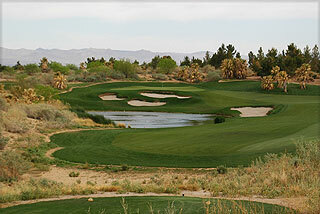 In our books - the Desert Course at Primm is without question in the top three! 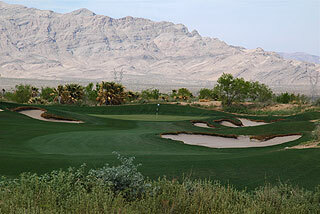 This is desert golf in its purity! This Fazio design is landscaped to fit in with the natural desert environment that includes cacti, native plants and grasses. Throw in some palms, a few lakes and ponds, plus spectacular mountain backdrops, and this is a course golfers will remember. What is completely surprising is how Mr. Fazio could take a terrain such as this, and develop two outstanding courses that are so entirely different in nature. Changing elevations, rolling fairways , breathtaking plateaus and incredible desert vistas will convince golfers that they are playing in a totally different environment from the Lakes Course at Primm. Like the Lakes Course however, conditioning from tee to green here is impeccable. Workers are constantly fine tuning the fairways, traps, greens and native areas, and their work is greatly appreciated by all who visit. Wildlife, in the form of rabbits, herons and other native species is also abundant. If you go into the desert to look for your ball - take a club with you to ward off a possible snake encounter. 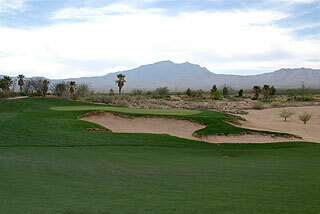 Unlike many desert layouts in Arizona, there are few forced desert carries on this golf course. There is generally plenty of fairway off the tee, but placement between bunkers and to level landing areas is a skill that will come in handy. Four sets of tees play to 7131 (138 slope), 6540 (130 slope), 6085 (124 slope/138 for women) and 5397 (129 slope). We recommend the white tees (6085) for average, mid handicappers - especially on the first time through. In addition to the same measurement tools provided on the Lakes course, the desert features sprinkler heads measured to the front, back and middle of the green. We also recommend you purchase ($5) a hole diagram/yardage guide, which will help with choosing landing areas and in avoiding trouble. The opening hole is quite tame, a mid-range par four that plays to a well bunkered green complex. Aim right on the approach, as the slope will funnel shots towards the center. You must be long off the tee to reach the par four 2nd in regulation. If short of the left fairway bunkers, the best option is to approach to the right, playing for a possible up and down par - which is a great score on this number one handicap. A tee shot hit left center will avoid the huge fairway bunker, leaving an easy approach on number 3. The par three fourth is a beauty that plays uphill and invites entry from the right side - taking the treacherous green side trap on the left out of play. Those landing their tee shots past the fairway bunkers on 5 will benefit from a nice downhill slope, leaving just a short iron to the elevated green. This 3 hole stretch (3 through 5) is the easiest of the layout. Numbers six and seven provide distinctive landing zones along the left side of both fairways, with formidable desert areas to the right. The approaches on both of these holes will require a good deal of precision, and most likely will be played with the ball below your feet (for right handers) on the left to right sloping fairways. It does not get easier on eight, which is the second of back to back par fives, and a true 3-shot hole. The right side is the safe place to be off the tee, and an elevated putting complex will require a high, arcing approach. A shot hit off the right bank will trickle towards the center of the green on the par three 9th. This shot shape will take the pond on the right out of the picture. The back nine opens with the toughest hole on that side. There is room right off the tee, which is the safe side from which to approach the well bunkered putting surface. From the black tees (473 yards), this is a monster of a par four. 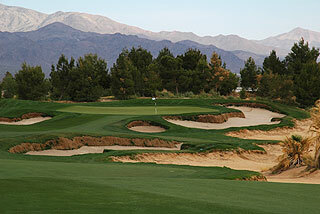 Eleven is a gentle par three, with plenty of bail out room short of the green, past the desert area. The par four 12th is tight and long (455 from tips, 383 from whites), and is followed by a challenging par five with a fairway framed by desert waste areas. Avoiding all the sand on this hole is a tough proposition. The par 4 four 14th requires some thought and careful club selection. A mid iron lay up to the right side will leave a shorter approach, but one that is all carry over desert. Another option is to hit a longer iron or wood to the far left of the fairway, thereby taking most of the waste area out of play. Either way, the approach becomes easier if you leave your tee shot just short of the hazard.Fifteen is the toughest of the par threes, but can be managed more easily if the pin placement is in front. Short right is a good option here. A beautiful mountain backdrop frames the 16th green, which can be most efficiently approached from the right side of the fairway bunker. The short par four 17th invites a tee shot aimed to the right side, landing about 100 yards from the green. From here the approach is easy on this dogleg right 18th handicapped hole. Number 18 is a score-able par five, featuring an open fairway leading to a tight green complex with bunkers and a small cascading waterfall left. The beautiful landscaping leaves one with a perfect image with which to leave the course. 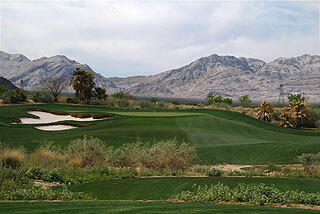 We played the Desert Course twice during our visit, and found that it was much easier to play the second time around. The layout presents nuances that must be learned if one is to score well here. Club selection is important off the tee, as there are great advantages to landing on the correct portions of these often sloping fairways. Distance on approaches as well can be more easily judged after an initial round. 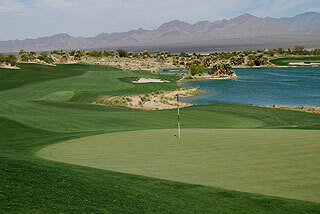 Take mental notes...We can describe the Lakes Course as incredibly beautiful - the Desert Course is totally AWESOME! This is a challenging layout that demands your best - but is so undisputedly gorgeous that hackers will enjoy a round here as well - and will find it truly memorable. The service at this property is also impeccable. Everyone from the head of golf operations (Mark Yelenich) to the informative and friendly rangers and service staff are obviously happy to be here, and are thoroughly proud of the Golf facilities. The food and beverages are excellent, and locker rooms for men and women (with showers) are on property. It took us a little over 1/2 hour to drive from Mandalay Bay on the strip - making a day trip here completely worthwhile. 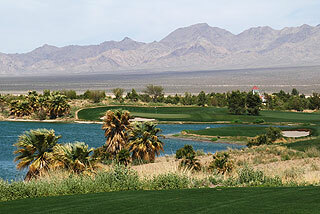 Visit Primm and we guarantee you will want to return to play these two fabulous courses again and again. With the high tech Golf Academy, this is an ideal place to take in some lessons or attend one of the golf school programs. Primm Valley, Whiskey Pete's and Buffalo Bills offer a great variety of amenities and are wonderful places to stay for a few nights. 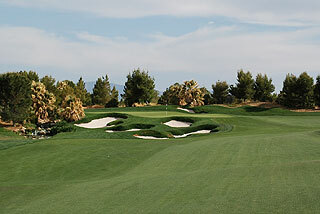 Informational pages for both courses and for the Primm Valley Resort are online - in our very thorough Las Vegas golf section.